(a) Inspect the tires for wear and proper inflation pressure. (b) Using a dial indicator, inspect the runout of the tires. 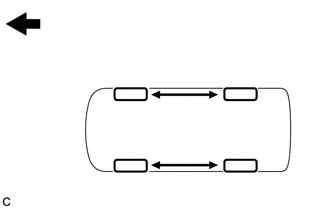 (a) Rotate the tires as shown in the illustration. (a) Check and adjust the off-the-car balance. Use a cleaning detergent to remove dirt, oil and water from the surface where the balance weight is to be adhered. Do not touch the adhesive surface of the balance weight. 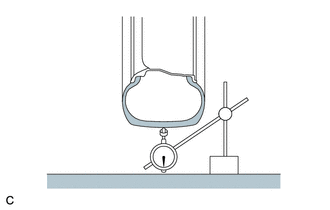 Adhere a stick-on type balance weight to the flat surface (A) shown in the illustration. Push the balance weight with your finger to securely adhere it to the desired position. Do not reuse balance weights. Use clip-on type balance weights for the inner side, and stick-on type balance weights for the outer side. (a) Inspect the front axle hub bearing looseness (See page ). 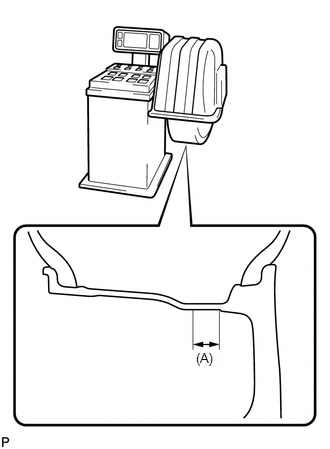 (a) Inspect the rear axle hub bearing looseness (See page ). (a) Inspect the front axle hub runout (See page ). (a) Inspect the rear axle hub runout (See page ).